Another day, and another district is going 1:1. That’s the good news. T&L wanted to see if there were any steps to take—or to avoid—to ease implementation and everything thereafter. 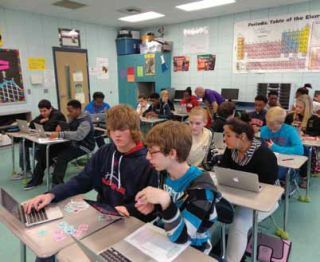 Middle schoolers in Alabama collaborate in Google Docs. A Quick Look: This year, 658 7th- and 8th-graders at Oxford Middle School in Oxford, Alabama received MacBook Airs. For now, the laptops remain at school, but the plan is to let students bring them home next year. There’s a 1:1 MacBook Air program at the high school, too, in which 1,400 students bring their laptops home. ■ Splashtop: Teachers use it to link the iPads, control the desktop, and share their apps. ■ iMovie: Teachers can use this program for project-based learning. ■ Pages and Keynote: These apps are great for creating projects. ■ Schmoop: Test prep and more. ■ ClassDojo: This program works well for classroom management. ■ Google Docs: This program is good for collaboration, presentations, drawings, and documents. Sixth-graders at Bedford Public Schools learned how to navigate their Chromebooks before the 1:1 rollout. A Quick Look: In January, Bedford (MI) Public Schools handed out Acer Chromebooks to 380 6th-grade students. The plan is to roll out two additional grades each year, with a 1:1 program for grades 3–12 by 2018. ■ PlanbookEdu.com: This Web site provides an online lesson-planning tool that lets teachers align benchmarks and use the digital tools they learn about in ongoing professional development sessions. ■ Edmodo: Teachers & students can discuss, connect, and collect in this safe online space. ■ SpeakIt: This app reads text passages that students highlight. It also helps at-risk and special education students to be more independent. Above: A high school student in horticulture class uses online resources to study class materials. Below: Beckermann teaches his journalism students about photography. How It’s Working Out: “We have intentionally called this a Digital Learning Initiative instead of a 1:1 laptop initiative because it’s not about the technology by itself—it’s about student learning. More specifically, it’s about improving student learning through the use of digital tools. In my opinion, moving to a 1:1 environment in the classroom is just the beginning. Once teachers and students can rely on having these powerful tools available in their classrooms every day, they can begin to innovate and find better ways to improve student learning. It opens a whole new world of possibilities. ■ LanSchool: Teachers use it for classroom management and monitoring. ■ Serif Design Suite: This program costs less than Adobe Creative Suite and is great for video editing, photo editing, and desktop publishing. Glenview students adapted quickly to using their iPads. A Quick Look: Glenview (IL) School District #34’s education foundation funded a major portion of the last two years, in which the district pilot tested a 1:1 program. In the first official year of its 1:1 program, students in grades 1–5, as well as one 6th-grade class and one 7th-grade class (3,700 students in total) are participating. Next year the 1:1 program will include 5,000 K–8 students. Device Details: “The iPad provided the most access to resources, creativity, and content development. It also gave students the ability to manipulate information and work in an open-ended environment,” says Brian M. Engle, executive director of educational technology. ■ Schoology + Google Drive + Notability: The middle school teachers love how this trio of workflow apps works together, and education technology facilitator Candace Marcotte says they seamlessly let students import and export resources and turn in work. ■ iCardSort: This app is great for brainstorming, outlining, planning, and learning vocabulary. ■ Popplet: This app helps students brainstorm and take on other tasks. Teacher training is essential to any successful 1:1. Too many districts still say: We want to buy [insert product X]. How many should we get? It’s much wiser to figure out your end goal and then see which device or devices will help your teachers get there. One district taking this approach is Orange County (FL) Public Schools. As it is the country’s 11th-largest district with 190,000 students, administrators decided to pilot various devices before scaling up. Six different schools are trying out MacBook Air laptops, full-size iPads with external keyboards, HP 4440s, Lenovo Chromebooks, Samsung Chromebooks, and the Classmate PC. “It’s a very diverse range, but we need to understand which platform and device will work best with our curriculum and have the smallest impact on our technology infrastructure,” says Mariel Milano, director of digital curriculum and instructional design. With so many disparate ecosystems, the district decided to unify on the back end so everyone in the pilot is using Google Apps for Education for email and to produce and store content. This decision also helped streamline professional development. Each month, a program evaluation team looks at 30 metrics, including progress monitoring, usage, breakage, and theft. The team marries that data with student, parent, and teacher surveys to produce reports. In two years, Milano says the district hopes to have one ecosystem for grades K-1, 2-5, 6-8, and 9-12—but not necessarily one device— on which to standardize. DO: Use a learning management system (LMS) like Schoology. DO: Have a backup plan in case devices don’t work. Nothing should require a device in order to be completed successfully. DO: Use a “Screens Up, Screens Down” approach or a similar system to let students know when they should or should not be using their devices. DO: Create a Responsible Use Policy that defines expectations and what responsible use of a device looks like. DO: Have students use a device to make things and show what they are learning. DON’T: Take away a student’s device if they are misbehaving. Would you take away their notebook or textbook? DON’T: Let the device drive the lesson. Devices should enhance the lesson. Devices are not a learning outcome. DON’T: Think that tech needs to be used all the time, every day. Sometimes pen, paper, and books are better. DON’T: Expect students to learn about an app/program/ Web site and use it in the same day. They will need time to play with it. DON’T: Forget to make your physical classroom space more collaborative to meet the needs of your 1:1 students. Chris Aviles teaches English at Barnegat High School in New Jersey. He presents on education topics including gamification, technology integration, BYOD, blended learning, and the flipped classroom. Read more at Teched Up Teacher (www.techedupteacher.com). Some people think a 1:1 program is the ultimate goal. I think it’s just the beginning. Once every student has consistent access to the tools for learning, then teachers can begin innovating and revolutionizing their classrooms. DO: Involve stakeholders in the decision-making process (including choosing a device). DO: Choose a device that meets your program objectives. DO: Train your staff—this is critical! DO: Provide integration support during implementation. DO: Focus on what you can do with the tool, not the tool itself. DO: Provide ongoing training. W e provide summer tech academies, professional development strands during the school year, full-staff workshops, and Professional Learning Community support as well as help materials (videos and documents) posted online. DO: Go at a pace that is right for your district. DO: Celebrate and share successes. DO: Have consistent expectations for students. DON’T: Focus solely on the device. DON’T: Expect success without integration training. Paul Beckermann is a media and digital learning specialist at Dassel-Cokato High School in Minnesota. Last year, our school launched a 1:1 iPad initiative. In math and science classes, we shelved our textbooks and began using open educational resources (OER) to create our own multimedia courses. While some teachers were quite proficient using digital content, others felt a bit like pioneers. Do make sure your staff is ready. We provided iPads to our teachers during the summer so they could become acquainted with the tablets months before rolling them out to students in November. Don’t overwhelm teachers with everything at once. We provided education and training to our teachers just as we would with our students—paring everything into small chunks of information to make it easier to digest. Do create a framework for early adopters to share their expertise. We held monthly lunchtime “Appy Hours” to provide a forum for early adopters to demonstrate how they used the iPads, OERs, and different apps. Teachers enjoyed learning from their colleagues and knowing they could get help if they needed it. Do allow for flexibility as teachers integrate technology into their courses. As we eased into our 1:1 program, I did not require teachers and students to use the iPads every day. I gave them the flexibility to naturally progress through the stages of technology integration. Do provide continuing education and training. We regularly send staff to conferences, and last fall I traveled to the EdTechTeacher iPad Summit with our math and science department heads. Don’t forget the content or content management. To simplify the world of OERs, we use Net Texts. With this free, Web-based system, our teachers can easily access and use the vast library of free, high-quality OERs available on the Internet and then publish directly to students’ iPads. Teachers can select existing courses from the library or create new courses by mixing and matching items with their own educational materials. Don’t let technophobes off the hook. Whether you completed your training as an educator three years ago or 30 years ago, the world has changed and we must change with it. We must show our staff and students what it means to be lifelong learners. Do demand rigor and quality from OERs. We seek the same quality and rigor with OERs that we would for a textbook, curriculum software program, or any other resource. With OERs, some think that because it’s free, it’s okay to settle for less. It’s not. Don’t expect to find everything you need for free on the Internet. Even with all the OERs available we haven’t been able to find everything we need for every course, so we create our own content, such as video lessons. Teachers like being able to explain concepts and skills to students using their own methods. Don’t expect that every student will have Internet access at home. Almost 70% of our students are economically disadvantaged. One thing we like about the Net Texts app is that students can download their courses onto their iPads and use them offline. Do expect change. We are transitioning from an instructional model where teachers dispense information to a model where teachers are facilitators and students take a more active role in their learning. This approach is exactly what we need to prepare our students for success now—and in the future. Jay Barrett is the principal of the Amarillo Area Center for Advanced Learning, a math/science specialty high school in Texas.